Some 51 million Thais are eligible to go to poll today after more than four years of military rule, for a highly-craved general election to decide the immediate futures of a divided nation and of controversial figures competing for political control, including the man who put a brake on the “democracy” himself. The voters’ choices are difficult but obvious: Continuing to live under a former military man who has staged a coup but who is presenting himself as a candidate in a democratic system described by admirers as unorthodox and by critics as unfair, or embracing those advocating old-fashioned democracy offering greater freedom and probably fairness but was plagued with questionable activities and occasional violence. 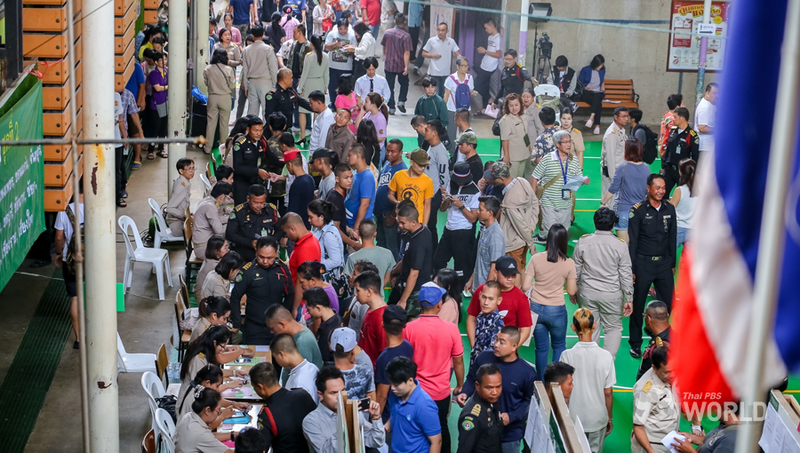 While Prayut Chan-o-cha as the sole prime ministerial nominee of the Palang Pracharat Party can be a glaring irony for the election, his participation provides one of the two choices Thai voters are making today. His opponents are the politicians who assert that the political system is better off without him on the center stage. "The voters' choices are difficult"
For God's sake, who writes this drivel? Yes, it is so, so, so VERY difficult to know whom to vote for (and whom not) after the last 5 years! Thai PBS reporter must be seriously confused.........The voters choices are diifcult. So far Prayut and Pheu Thai are well in the lead with 25.9% and 25.6%, respectively. The next nearest is around 20%, a new party, I think. 3 red ones certainly complicate the matter. Good luck to the Thai people. And good job having an election. Stop your crying. Every Thai I know wanted this result. surprise Thais want stability and not baying for a bloody civil war like most farang who would quite frankly jump on the first flight out and watch the carnage from the safety of a first world couch. Well thats up to the Thai people to decide that. Its their country. So I wish them the best without engaging in snide and cynical bullsh*t that is derived from an inherent feeling of farang superiority to these childlike brown folks who are so much less developed.
" Former military man who has staged a coup but who is presenting himself as a candidate in a democratic system " is the key here .. It is his default setting to pull the rug from under a elected gov' deemed not worthy of serving the country .. as he has already demonstrated once .. the rewriting of the constitution to hamstring any future free thinking administration and then standing as an " honorable " candidate in an election that merely pays lip service to the word democracy is nothing more than a charade .. He with all the backers of the last 5 yrs know its damn near impossible to lose their grip on Thailand now even if by the strangest of anomalies the results of the election does put the opposition in the driving seat .. If Chair P' has to relinquish the drivers seat then that will be only to take the passenger side waiting to yank the handbrake on again if he does not like the way the country is being driven ..